Family is the microcosm of the global community. 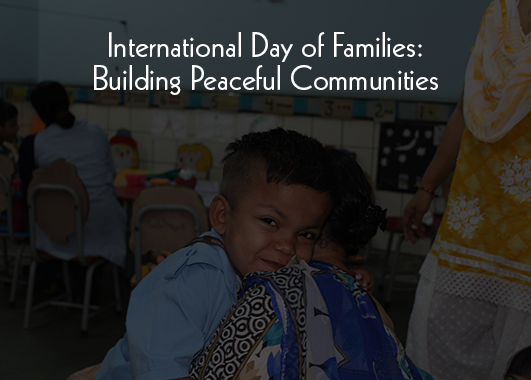 The role families play in forming healthy and peaceful communities is remarkable, which is why the United Nations commemorates the International Day of Families as a day to celebrate the peace, love and harmony that trickles down from a family to the community. It offers an opportunity to spread awareness about different issues concerning families, including social, demographic and economic processes. ● To promote better standards of living and social upliftment of families worldwide. ● To acknowledge the essence of people, families, societies, and cultures. ● To encourage the role of families as agents of change and progress. ● To spread awareness on issues affecting families across the world. ● To sensitize people on issues that relate to families, and promoting appropriate action. An ideal family is where people respect and love each other, and fulfill each other’s emotional and physical needs. We should all play our parts as members of a global family, and help each other through kindness and tolerance. The first step towards achieving this is ‘inclusion’. Without inclusion, a society is fragmented, and its growth stunted. Mata Bhagwanti Chadha Niketan: As a special education charitable school, MBCN aims to do away with taboos associated with people having disabilities. Through various awareness programmes, we spread the message of creating an equitable environment for everyone – a world where no person feels threatened or discriminated against. We focus on offering opportunities to the specially-abled that allow them to showcase their talent and become active members of our society. Sardar Kulwant Singh Chadha Skills Academy: Working towards empowering the underprivileged youth, our Skills Academy imparts various employable skills, and helps them get jobs. We strongly believe that making the youth financially independent uplifts their entire family, and raises their standard of life. Health Camps: A community cannot flourish if it’s not healthy. PCF-organised health camps in rural areas ensure that basic healthcare reaches the underserved. Likewise, free medical services are offered on a regular basis in association with health workers from Dr. Ram Saran Garg Indo-German Hospital. Food Distribution Camps: Our sole aim of organising food distribution drives is to fight hunger and provide for the nutritional needs of the less-privileged. Bringing food and smiles to these children is what keeps us going! The onus of creating a peaceful and inclusive world rests on all of us. Let’s do it together! This entry was tagged Celebrating International Day of Families, Creating a Better World, International Day of Families, Objectives of Celebrating International Day of Families. Bookmark the permalink.